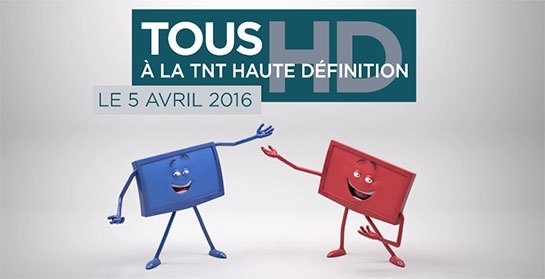 In what is believed the first MPEG-2 switch-off operation in the world, France has launched a campaign informing viewers that from 5 April 2016 all digital terrestrial broadcasts will be in MPEG-4 and HD. The country’s frequency authority ANFR (l’Agence nationale des fréquences) has started to inform viewers of the upcoming switch-off. On a special website, viewers can see whether or not their receiver is compatible witb the new DTT standard. From April the French digital terrestrial and satellite network will be available exclusively in HD with an offer of 29 channels. During the first quarter of 2016, 12 new HD channels will be available free-to-air (BFMTV, D17, D8, iTélé, Gulli, NRJ12, NT1, TMC, W9) as well as three premium (pay-TV) HD channels (Canal+ Cinéma, Canal+ Sport and Planète+). Already available are TF1, France 2, Canal+, Arte and M6, who started broadcasting in HD in October 2008 and HD1, L’Équipe 21, 6Ter, Numéro 23, RMC Découverte and Chérie 25, that became available in December 2012. DONT LOSE YOUR VIEWING - UPGRADE TODAY!